Even our Olympic champions had to start somewhere so, whether you aspire to Olympic glory or you just want to have some fun and challenge yourself our Dressage Series is for you. The championship series is open to all of our riders (young and not so young!). Rosettes to 6th Place and Series Championship Trophy. Last year there were 2 different tests to try: Preliminary and Novice. Perfect for young riders, our mini show jumping classes are great fun and give riders a chance to jump a course and win a rosette. 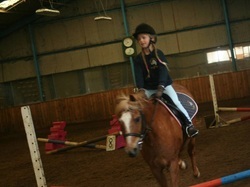 Riders can be led for the smaller classes. Entry fees are payable at time of booking and are not refundable. 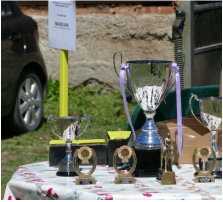 Ponies/horses will be allocated after close of entry. Late entries may be taken if there is space available at an additional £4 per entry charge. For the more experienced riders who want to get out in the fresh air and have a change of view, there is the two hour hacking route. Novice children - This holiday is for children who can canter. You will help to look after your pony. There will be lessons in both riding and stable management. Show on the second day. Each day will start at 9:30 and finish at 3:00. You will need a packed lunch. £130 to include a £20 non-returnable deposit paid at the time of booking. Min 6 - max 8 riders. Aimed for riders between 7-12 years. 9-14 years old. For those who can canter and jump confidently. Lessons in riding and stable management. Show on the last day. 9:30 - 3:00. You will need a packed lunch. £195 to include a £20 non-returnable deposit paid at the time of booking. Min 6 - max 8 riders. For those who can canter, jump and hack confidently. Lessons in riding and stable management. 9:00 - 3:00. You will need a packed lunch. £195 to include a £20 non-returnable deposit paid at the time of booking. Min 6 - max 8 riders. Suitable for riders on the following group lessons: Wed 4:15, Thurs 4 and 5, Fri 4:15, Sat 10 and 12, Sun 9 and 10. We're always trying to think of ways for our riders to put what they've learned to the test, so remember to ask about any upcoming events and who knows, you may be our next winner.